WELCOME, KEN CHONG, OUR NEW BUSINESS MANAGER! Ken Chong is the new Business Manager responsible for the service line offered by KPrime. Prior to KPrime he was the General Manager of Core Laboratories in Canada. He has a BSc in Chemistry and Biochemistry from the University of Victoria and Chemistry PhD and MBA degrees from the University of Calgary. When not working Ken enjoys being active outdoors and playing squash. He looks forward to meeting all KPrime clients in the near future. Using Agilent’s state-of-the-art analytical instrumentation and software solutions, MGH researchers have been able to measure more than 300 chemicals involved in the body’s metabolism. Dr. Robert Gerszten his team have identified several chemicals that become elevated up to 12 years before symptoms of diabetes and heart disease become apparent. HOW "AGILENT" GOT ITS NAME. This week, the U.S. National Aeronautics and Space Administration announced evidence of liquid water currently flowing on the surface of Mars. Earlier, NASA had found evidence that an ocean of water may once have covered a quarter of the planet. These discoveries add to the exciting possibility that life exists - or once existed - on Mars. 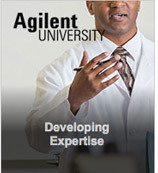 Agilent University provides online, on-site and classroom training and education to laboratory staff, helping expand skills and improving lab productivity. Michael Crichton's 1990 novel Jurassic Park used ancient dinosaur DNA to create new specimens. While bringing dinosaurs back is not likely in the real world (dino DNA is too degraded to work with), scientists are actively researching the possibilities of "de-extinction." One possible candidate is the passenger pigeon. Whether testing for poisons in a forensics investigation, analyzing explosives and their residues, checking a crime scene for illicit drugs and their precursors, or analyzing fingerprints — FTIR (Fourier Transform Infrared spectroscopy) technologies offer critical insight into crime scene samples both in the field and in the lab.